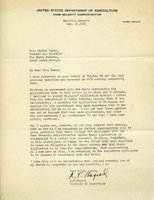 L. T. Hagood assures Martha Berry he will no longer employ any students from the Berry schools unless their application is accompanied with permission from her or another administrator from the schools allowing them to be employed elsewhere. 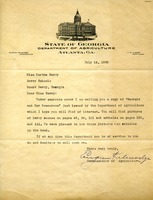 This letter is to the Berry Schools from the State of Georgia Department of Agriculture, informing them that pictures of Berry Schools are in the new agriculture book, "Georgia and Her Resources." 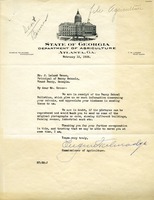 Mr. Talmadge, Georgia's Department of Agriculture, is thanking Mr. Green for sending him the Berry Schools Bulletin and asking for some original photographs of the school.